Ice temperatures inside the world's highest glacier on the slopes of Mount Everest are warmer than expected and especially vulnerable to future climate change, warn glaciologists. In 2017 the EverDrill project research team led by Dr. Duncan Quincey from the University of Leeds became the first to successfully drill into Khumbu Glacier in Nepal and record temperatures deep below the surface layer. 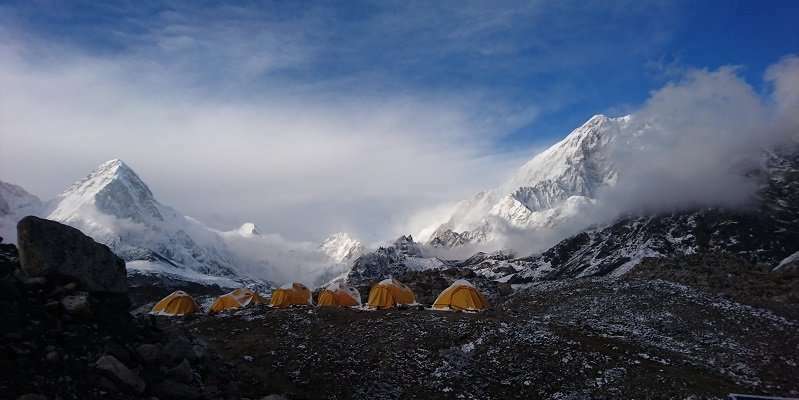 Study co-author, Dr. Quincey from the School of Geography at Leeds, said: "The temperature range we measured from drill sites across the Khumbu Glacier was warmer than we expected –and hoped – to find. "'Warm' ice is particularly vulnerable to climate change because even small increases in temperature can trigger melting. "Internal temperature has a significant impact on the complex dynamics of a glacier, including how it flows, how water drains through it and the volume of meltwater runoff – which makes up a crucial part of the water supply for millions of people in the Hindu Kush-Himalaya region." Study lead author Katie Miles from Aberystwyth University explained that the Khumbu Glacier's vulnerability may have serious consequences for the lifespan and amount of meltwater runoff in the coming decades and it will be important to determine if other glaciers in the region have similar internal characteristics to Khumbu. Dr. Quincey said: "Until now, the limited amount of data collected from glaciers in this region has made it difficult to predict how environmental change could affect the glaciers' internal dynamics. "Insights from the EverDrill project can aid scientists in forecasting the impact of global warming and how long the region can rely on meltwater to feed downstream water supply."